The Trio: Colin Farrell, Christopher Walken and Sam Rockwell give the movie the funny, quirky feel that makes the movie so great. Farrell’s character, Marty, is an alcoholic screenwriter that plays the straight man. Walken plays the part of a reformed religious character, Hans, that doesn’t like violence. And Rockwell plays the crazy wild card Billy. The trio has great chemistry throughout the film and they each give solid standalone performances. Sam Rockwell: I mentioned above that they all give solid performances, but it is Rockwell’s character that truly steals the show. He plays Billy who is truly a psychopath and a loose cannon. Rockwell delivers some great monologues and he commands your attention every moment he is on screen. Marty’s Screenplay: Colin Farrell’s character is writing a screenplay titled Seven Psychopaths. I don’t want to ruin too much for you, but I will just tell you that the movie is not just about a dog kidnapping. Humor: You must know a couple of things about the humor in this movie. The film is not a laugh out loud, rolling on the ground type comedy. Instead, it is a dark-subtle comedy that presents a lot of crazy, sometimes unrealistic moments. Violence: There is a lot of violence in Seven Psychopaths and it is fantastic. It is over the top gore and includes scenes in which throats are sliced and heads explode. That may sound ridiculous and unnecessary, but trust me the gore blends prefect with the overall premise of the movie. Marty’s Screenplay: The only reason I mention Marty’s screenplay is because it plays out as a movie within a movie. Many people do not like when directors try and put a movie within a movie. However, the screenplay did not detract from the movie and provided the movie with some of the more emotion parts. Olga Kurylenko: I wish Olga Kurylenko was give more a role. Her role was no bigger than a small cameo in the film. She is not given much to do and her talented is sadly wasted here. 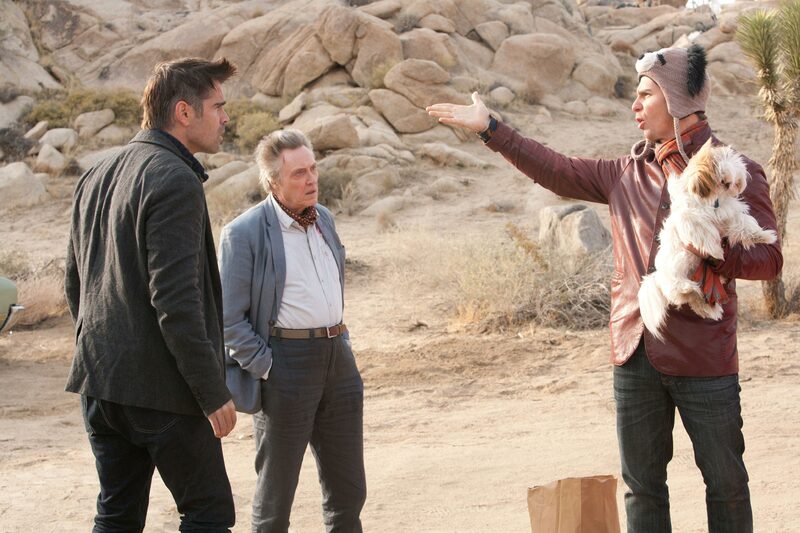 If you enjoyed In Bruges, then you will love Seven Psychopaths. McDonagh includes all of the violence and witty humor of In Bruges and expands upon it. Sam Rockwell is the standout star of this film and makes the price of admission worth it. This entry was posted in Film Reviews, Uncategorized and tagged Movie Reviews, Movies, Rotten Tomatoes, seven psychopaths. Bookmark the permalink.